Marble Mountain or Non Nuoc is a well-known attraction among local and foreign tourists. It is considered as a "spiritual" land of Quang Nam - Da Nang. The Marble Mountain includes 5 spectacular mountains which are named after 5 elements of the universe: Metal, Wood, Water, Fire and Earth. They look like bonsais emerging between a vast hillock. Every mountain has its particular beauty in shape, position, material with many caves and temples inside. Water Mountain is the largest and also the most beautiful one. The fanciful and dreamlike space, sacred temples, monumental caves, green trees, white sea wavesand the temple bell all contribute to the fairy picture of wonderful land. Marble Mountain - Da Nang is truly a heaven of all tourists. Marble Mountain is home to many caves and temples in Danang. Visiting this place, visitors can not miss these sarced pagodas: Tam Thai, Tam Ton, Linh Ung and beautiful caves: Huyen Khong, Linh Nham, Van Thong, Lang Hu, Van Nguyet or other places of “afterlife” such as Anh Linh, Phan Quy palace, Ming Wang palace, A Ty Hell, Giai Oan stream. In addition, Village Non Nuoc at the foot of Marble Mountain is famous for stone carving. The unique thing here that nowhere can offer is that after hours climbing up and down hundreds of steps to visit caves and temples inside the mountain, visitors just need to head a few hundred meters to Non Nuoc Beach for an easy walk to enjoy white sand, blue water and soft waves in Non Nước. Journey to travel around the coastal city to visit two famous tourist attraction of the city is Son Tra Peninsula and Marble Mountain will definitely give you a tour of the exciting in limited time. Son Tra Peninsula is allso known as Tien Sa Mountain. Its name is from a legend that Son Tra was called as a stop for farries in the past. Known as the only jungle in Da Nang, Son Tra Peninsula is considered as a hidden jewel of this coastal city. The journey to discover Son Tra can be started with monumental view from Vong Canh Hill. Then, you can be immersed in white sand and blue sea at Ngoc Mountain and admire Hai Van Pass from distance. Symphony of the sun and wind will carry you to the Chessboard peak. Go along the paths of Vong Canh Hill , you will have a chance to relax at the giant banyan tree while hearing the birds singing, and if you're lucky enough, you can see many endangered animals. At the end of the journey, you can admire the highest Buddha statue where the majority of spiritual locals and tourists often go to. In addition, Son Tra Peninsula offers a fresh cool climate, with beautiful natural landscapes with rich flora and fauna, it converges all the elements for visitors to have fun activities, camping, picnic and fascinating adventure of pristine jungle. Son Tra Peninsula is also known as American called Monkey Mountain, which Da Nang reaching out the East Sea furthest. Ba Na Hill is an eco resort combining relaxing and entertaining area with modern equipment. It luckily has an ideal climate all year round and is a perfect tourist destination with four separate seasons in a day. Particularly, morning - spring, noon - summer, afternoon – autumn and evening - winter. The entertaining area is designed for all ages, combined with lots of gardens such as love gardens, a vineyard, a fairy garden, an indoor amusement park named Fantasy Park. Especially, there is a village of villas which was buit in French architecture. This village is always a not-to-be missed stop for photo lovers. An Son Hamlet – Hoa Ninh Commune - Hoa Vang District. 25 km to the southwest of Da Nang at an altitude of 1,487m, Ba Na Hills are considered as “One temperate place in the tropical forest” because the climate is cool all the year round and you can enjoy four seasons within a single day. Museum of Cham Sculpture is the largest exhibition museum in Viet nam. This museum was built by the French in Gothic style with total area of 6,700 sqm and 2,000 sqm of display area. The museum specializes in collection, storage and presents of sculptural relics of Cham Kingdom with a total of 500 samples. The ancient specimens are exhibited in this tourist destination include decorative plaques, shrine, statue in sandstone and terracotta materials which are collected from the Cham towers in the Central of Viet Nam. Guests who visit Museum of Cham Sculpture get an opportunity for viewing many valuable antiques as Ganesa and Apsara goddess statues. Visiting Danang city, swimming is an indispensable activitiy. 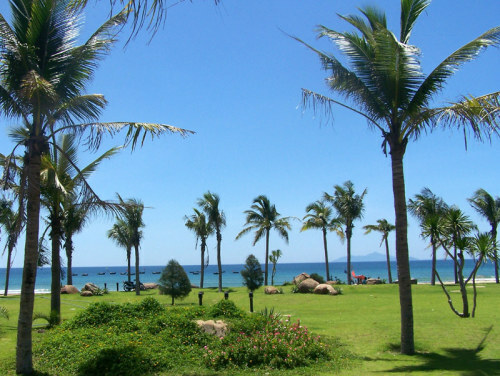 Danang East Coast beaches are great tourist destinations where you can swim into blue waters and experience extremely interesting water sports and games. My Khe Beach is voted by Forbes magazine as one of the most attractive beaches on the planet. With a coastline stretching to 90 meters, blue waters, fine white sandy beaches, and high-end hotels. My Khe is an ideal destination for those who are in love with beaches. Also, there is a great selection of water activitiws in Da Nang, which can help you to spend a day long in Da Nang beaches. Pham Van Dong beach is where both locals and foreigners take delight in swimming, picnic and snorkling. For its quiet waves and cool vibe, Pham Van Dong is a great place to get an escape from the busy lives. With nearly 4km of coastline, white sand, blue sea and the luxury resort, Bac My An Beach is considered as a resort of international class. Bac My An includes 5 beautiful beaches, including beach T18, My Da Dong 2, My Da Dong 3, Bac My An and the Furama Resort area, you can choose an appropriate stop which suits your interests and financial situation. Location: Bac My An, Ngu Hanh Son, Da Nang City. Non Nuoc beach is a must-visit place for those who are in love with pink sand beaches and shadow bush to take rest after swimming. Visiting Non Nuoc beach, apart from taking a rest, swiming and enjoying fresh seafood, guests can visit the auspicious Marble Mountain, stone carving village or make a cruise on the Cổ Cò river. Traveling around Danang city to admire many outstanding beaches in Da Nang and try the best Danang cuisines at night is a wonderful experience. You can take these Danang by night tours to enjoy the sparkling Danang at night! Da Nang Seafood Trail is a true culinary adventure along the beautiful west coast of Vietnam, allowing you to sample mouth-watering fresh seafood. You will explore some of the most spectacular coastal scenery Vietnam. Da Nang has been known as the city of bridges. Each bridge has its own beauty and architecture. The impressive bridges scoring records are pride of Danang people. 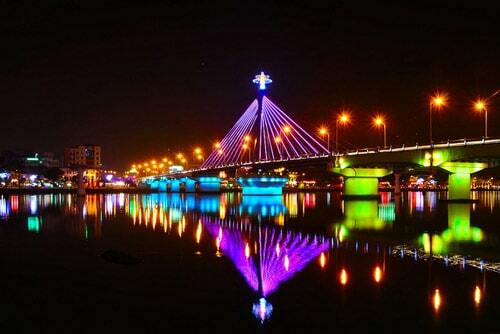 Han River Bridge: the only colorful rotated bridge in Viet Nam, a symbol of Da Nang city. Every day, the bridge will rotate 90 degrees around the axis at 0: 30, opening the way for large ships to pass, and close at 3:30 a.m.
Dragon Bridge: This new bridge was finished in 2013, connecting the Da Nang international airport with My Khe Beach and Marble Mountain. You definitely don’t miss a performance that "Dragons" spewed fire and sprinkler at 21:00 on Saturday, Sunday nights and special occasions. Tran Thi Ly Bridge: Tran Thi Ly Bridge is a romantic and poetic bridge which is lightened up by thousands lightings. From distance, Tran Thi Ly Bridge looks like a wing sail reaching the ocean. Thuan Phuoc Bridge: Thuan Phuoc Bridge is considered as the country's most beautiful bridge. The bridge becomes at it best at late nights. Danang Cathedral or Chicken Church is one of the most well-known churches in the city. This 70m high building is the only church built in Da Nang during French colonial times. The church has Gothique architectural style with soaring lines and the diamond shaped dome. Inside the church, there are statues and paintings of Christ and biblical illustrations decorated in the form of Christian Western art. The amusement area is designed with different types of active vibrant recreational activities, including adventure games. Some widely liked games are readily available in Asia Park like rollercoaster, elevated trains, freefall tower, high-speed slides. Currently, a new game has been completed and officially operated is Sun Wheel. This huge roundabout is 115 meters high (equivalent to a 25- floor building) and is among the top 10 highest turnover in the world, become the new icon of Da Nang with the name "Danang Vision ". In addition, from top of Sun wheel cabin, visitors can have an overal view of brilliant panorama Danang at night as well as admire a great Buddha statue. Sun Group has proposed putting the multifunctional performance area in Asia Park to organize several events such as theater performances, opera, musical events, sports, movies, animal circus and dolphin performance. Additionally, a variety of water performance will also be held in Asia Park. Location: Asia Park, Hoa Cuong Nam ward, Da Nang city, Viet Nam. Best visit time: 7 p.m-9p.m. Sun Group – one of Asia’s Premier Real Estate developers – has chosen the resort town of Da Nang, on Vietnam’s central coast to develop an original amusement and culture park named Asia Park. Situated right in the center, Con Market and Han Market have attracted more and more tourists. The markets are very diverse with various kinds of goods such as shoes, clothing, fabrics, handbags, souvenirs and gifts. The prices are relatively cheap because they are all wholesale markets. Especially, Con Market is considered as a culinary paradise of Da nang with a long food court. Many specialties are served at the food court such as Quang Noodle, Gumbo, Grilled beef noodle,Vietnamese pancakes and sweet soup. Han Market is famous for its fresh seafood, fruits and specialties of Da nang like dried fish and other dried foods that visitors often buy as gift. PLAN A TRIP TO DA NANG with Justgola now!